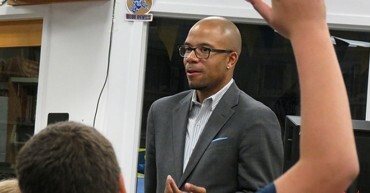 Quarterback of Life and former Penn State football player Adam Taliaferro, joined by two student leaders from Bellwood-Antis Middle School were live on We Are Central PA Live (WTAJ TV) on October 4, 2013. Beating the Odds Foundation presented a Quarterbacks of Life® assembly for four hundred eighty-six (486) 5th – 9th-grade students of Bellwood-Antis School District. Beating the Odds Foundation presented a Quarterbacks of Life® assembly for one hundred (100) 5th – 8th-grade students of Altoona Central Catholic Middle School. Beating the Odds Foundation celebrated its twentieth anniversary with a Beating the Odds Rally. Approximately, 5,000 fourth through seventh-grade students and their teachers of Blair and Cambria Counties were in attendance.